What Is A Resistor And What Does It Do? “What is a resistor?” she asked. “It’s a component that resists the flow of current,” I said. “Hmm… I don’t get it. What does it do to my circuit?” she asked. “Well, it doesn’t actually do anything actively,” I said. Sometimes it can be hard to understand what the basic electronic components do. Earlier I have written about what an inductor do and what a capacitor do. But what about the resistor? The resistor is a component that resists current. If you add a resistor in series with a circuit – the current in the circuit will be lower than without the resistor. FREE Bonus: Download Basic Electronic Components [PDF] – a mini eBook with examples that will teach you how the basic components of electronics work. A resistor is nothing magic. Take a long wire and measure the resistance, and you will realize that resistance is just a normal property of wires (except for superconductors). 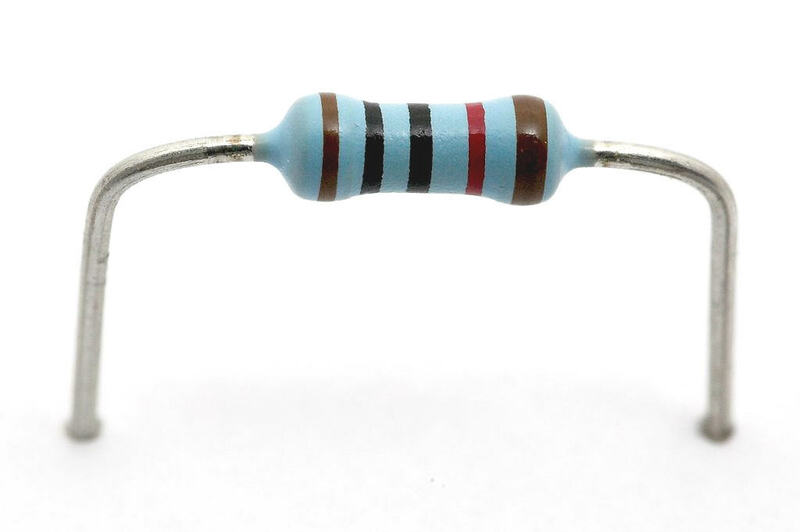 Some resistors are made up of just that. A long wire. What Does The Resistor Do To My Circuit? The resistor is a passive device and doesn’t do anything actively to your circuit. It’s actually a pretty boring device. If you add some voltage to it, nothing really happens. Well, maybe it gets warm, but that’s it. BUT, by using resistors, you can design your circuit to have the currents and voltages that you want to have in your circuit. So the resistor gives the designer control over his circuit! How about that? At the beginning of my electronics career, I thought it seemed like resistor were just randomly placed around a circuit and I thought that you didn’t really need them. For example, I remember seeing a circuit with a 9V battery, a resistor, and an LED. Then I tried using only the battery and the LED, and it still worked! But after a few seconds, the LED turned really hot. So hot I almost burned my fingers. Then I started to realize that maybe there was something to these resistors. Read more about using a current limiting resistor. Learning to work with resistors is important in electronics. One fundamental skill you should learn is how to use Ohm’s law. Learn about choosing a resistor. You didn’t answer my question on what is a resistor. You see, a resistor is just like a paneer roti that my mamaji makes. It resist the flow of the daal that is supposed to go in the rice. So to put into real perspective the resistor stops the current from passing through. Although, sometimes the roti has many holes in it because my mamaji heats it a lot. Thus some of the daal passes through the paneer roti. So the rice or in my language we call it bhath it gets wet form the daal. So the current sometimes passes through the resistor so it doesn’t stop it completely. Now you may be wondering how I know this things, this is because my mamaji had taught me the ways of the science on rotis. You may feel like I am wrong or trolling you, but this is false. You see my mamaji had taken a roti course in the university of Bhangda it is a small university in the city of Puranik. There he learned that all cases of life can directly be related to roti and rice. To put this into an example of an everyday struggle like “I can’t tie my shoelaces”. This is like how many new chefs that can’t make the loaf properly because they don’t know how to. Thank you for your time and I am very sorry that I replied you late, but I am also taking the roti course so I was very busy. Sir that is the best and most memorable description of a resistor ever. Would you ever have time to tell us how a bipolar transistor works? Its a component that opposes the flow of current, inorder to protect other component in the circuit . Think of the electricity as water and a resistor a preset valve that only allows so much current and voltage thru. The explanation above is actually wrong or misleading in many areas. These formulas can be manipulated to solve different problems, but in the strictest terms it all comes down to voltage, resistance, and current. A resistor technically just drops voltage based on the current flowing through it and the resistance. Used a 1/4 watt resistor on a 5 volt adaptor to power a 3 volt LED. But the volt meter still showed 5 volts past the resistor. Is that right?? If the LED did not light up, that sounds right yes. Thanks for these, I really want to know more about electronics component. Resistor is an important component just like a slight break you apply to control your car speed. What are the color bands on the resistors? I see a lot of different colors. Is there a key chart I can look at that would help me figure out what the different color bands means? Also what is the difference between 4,5 and 6 bands? Wait what the heck is going on lol. What exactly does a resistor do? What’s happening “under the hood” ? Does a resistor slow down current? how so? A denser material that slows drift velocity? But then there’s also the conservation of charge so the current entering the resistor and leaving is the same?!? I don’t think it slows down the current but it makes it travel a longer distance cause it is a coiled wire. So I guess it could be just a extension to the circuit. For the longer the distance traveled the, I guess, thinner or smaller current gets. Also resisters do get warmed up so some of the current is leaking out . So If I am wrong let me know and teach me. Current is the amount of charge flowing through a certain point. You can say that the resistor slows down the flow of charge. But a circuit is always completely full of charge carriers – even when there is no battery connected. When you connect the battery, the voltage in the battery starts to push those charge carriers around the circuit. When one charge carrier is pushed out of the battery the charge carrier at the end of the circuit (right before the minus of the battery) is pushed into the battery. So when you insert a resistor into the circuit that slows down the charge carriers, the whole system slows down. YOU DIDN’T EVEN ANSWER THE QUESTION…. PROPERLY AT LEAST ON WHAT IS A RESISTOR, HAD TO GET HELP FROM THE COMMENTS.